2013 CPD Program Coming Soon! As America’s attention turns to the “school to prison pipeline,” the proper role of school-based law enforcement is under increased scrutiny. School Resource Officers (SROs) are police officers and sheriff’s deputies assigned to work in elementary, middle, and high schools. They are specially chosen and trained to carry out multiple roles as they employ the “triad nature” of the SRO position—acting as counselors and mentors, educators, and law enforcement problem solvers. 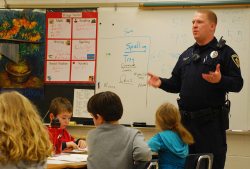 What is the proper role of the SRO in the school? As stories emerge about law enforcement or security officers enforcing school discipline rules (which is the proper role of school administrators, not law enforcement) or causing increased referrals to the juvenile justice system (something that well-trained SROs try to divert young people from because of the often poor outcomes that arise from contact with this system), it may be helpful to look more closely at what SROs actually do. This story is based on the experiences of 8 SROs in Cayuga County—a rural area in upstate NY. While the story happens to be about a community that is rural, the activities described are carried out by SROs in communities of every size in the US. 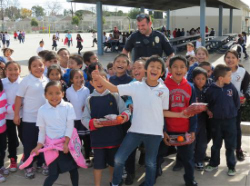 It provides a snapshot of what SROs do in their role as counselor, educator, and law enforcement officer, and offer a first-hand account of the diverse nature of school-based law enforcement. SRO Sam arrives at school in the morning, well before the students’ arrival. He inspects the area around the school to be sure that the premises are safe for arriving students. He checks his voice mail and e-mail messages and then has a quick meeting with the school administration to determine whether there is any information about students or family situations that could affect a student’s day at school. The principal tells Sam that last night he received a call from a parent who was worried that her daughter would be involved in a fight today, due to a threat that had been posted on Facebook. Sam and the principal check Facebook and see that the threat did occur. In addition, there is word that a domestic situation occurred in the home of one of the students the previous night. Sam checks his own Facebook page, where students often communicate with questions or requests for help with problems, such as being bullied. Having checked his messages and discussed the coming day with the school principal, Sam goes outside to the front of the school to greet the arriving students and monitor vehicle flow. He sees the two students who are involved in the Facebook incident, and pulls them aside. Sam and the principal bring the students to a room to discuss the incident privately. It soon becomes clear that the threats arose out of rumors. The problem is resolved, and the students return to class with no further disturbance between them. The boy whose family experienced the domestic incident acts up in class, and the teacher asks Sam to talk to him. Sam takes the boy out of class and talks with him about the importance of listening to the teacher’s directives. Because of the conversation the boy quiets down and returns to class. Sam patrols the halls to make sure that order is maintained. A student stops him to discuss the issues she’s having with some other students who hang out near her locker. Sam speaks with the principal, who assigns the student a locker in a different location. Sam’s next task is a sad one. A student recently passed away at home, very suddenly, and the student’s mother has requested that Sam retrieve the student’s belongings and return them to the family. The mother told Sam that her son often talked about him. Sam complies with her request. After his class, Sam heads to the cafeteria to join the students for lunch. The discussion is social, as Sam talks with the students about sports and other things they’re interested in. But today two students are beginning to fight. Sam intervenes, and the students are removed to the principal’s office, where one uses profanity, throws a chair, and is suspended. The principal asks Sam to make sure that the student leaves the building and does not come back in. When Sam checks, he discovers that the student has re-entered the school. Sam escorts the student out once again, and this time the student does not return. While checking the video monitors, Sam sees a student leaving school. He stops her, and she tells him that she is leaving because she does not want to be there. He explains that it is his job to make sure that she is safe. Her mother is called, and the student says that she is upset because some students have been picking on her. The students are called in to meet with the principal and Sam to discuss the situation. The students confess to the bullying, and the principal determines an appropriate form of discipline. At the end of the school day, Sam returns to the school entrance to monitor students’ departures. He ensures that student safety is maintained and that the school traffic plan is followed by buses and parents. Sam then joins a group of 60 students for the extended school day program. He and the other after-school staff help the students with their homework. Sam then takes a group of kids to the gym to play basketball. Around 5 PM they all head to the cafeteria to have dinner together. For some kids, this is the only sit-down dinner they ever have. Sam’s day is now complete, and he heads to the office to lock up before heading home. “Sam’s” story is adapted from one that originally appeared in The Citizen of Auburn, New York. That story was written by Katie Moran, Project Director of the Safe Schools/Healthy Students initiative site in Union Springs, New York. A Day in the Life of a School Resource Officer | Shift Scheduling may be Key to Improving Health and Cutting Costs | Seattle LEADs on Law Enforcement Diversion | DECSYS: Automating Collaboration | 2013 CPD Program Coming Soon! | Did you know…?